Experts continue to debate the relative merits of the Semmes-Weinstein mono­fila­ment for assessing diabetic foot ulcer risk, including how many sites on the foot should be tested, and which ones. But it’s tough to argue with the technique’s cost-effectiveness. As clinicians continue to refine protocols for assessing ulcer risk in the feet of diabetes patients, some researchers have questioned the utility of one old standby—the 10-g Semmes-Weinstein mono­filament. Others have quickly responded that the monofil­ament remains the easiest and most sensitive of screening devices, though they acknowledge it is not as specific they’d like. The issue remained largely a matter of opinion until recent research began to shed more light on the role of monofilament testing in detecting the loss of sensation that puts feet at risk. Michael Pinzur, MD, professor of orthopedic surgery and rehabilitation at Loyola University Medical Center in Maywood, IL, concurred. One problem, however, has been that not all monofilaments are created equal. Fortunately, there’s less variation than there used to be when they were made of horsehair. But even then there was dispute: was the mane better, or the tail? Not all clinicians agree with such findings, of course. Even so, clinicians diverge on many points—especially which points they test. A common approach—and that recommended by the ADA—is to test the plantar surface of the distal hallux, then the first, third, and fifth metatarsals on each foot.9 Needless to say, there are variants. This approach derived from monofilament testing’s origins assessing neuropathy associated with leprosy, as pioneered in the late 1960s by Paul Brand, MD, at the National Hansen’s Disease Center in Louisiana. A 1999 study published in the Journal of General Internal Medicine11 found that monofilament testing using only four sites per foot detected abnormal sensation in 90% of patients diagnosed using eight sites per foot. Those four sites have subsequently been recommended by the ADA protocol, which Armstrong said that he and his colleagues now follow. “We believe it to be more efficient, and we are likely not overdiagnosing too many patients,” he said. The field trends toward minimalism, in fact. 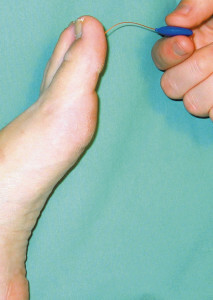 In a review published in the Journal of Vascular Surgery in 2009,12 Yale researchers concluded that to maximize the monofilament’s accuracy, clinicians should use a three-site test involving the plantar aspects of the great toe, the third metatarsal, and the fifth metatarsal based on the findings of three previous studies.11,13,14 There are other permutations; some clinicians don’t like testing callused metatarsals, for example, because the calluses interfere with the skin’s elasticity and sensation. Some of this professional disagreement is related to different ideas about what condition, exactly, clinicians are screening for. Often, as noted above, research has evaluated the monofilament as a test for DPN, and results have varied widely. But increasingly, clinicians are carefully specifying that monofilament testing is not for diagnosing neuropathy, but rather for identifying the high-risk foot. This is not a new idea, but lately it’s gained traction. The monofilament is not good at detecting early neuropathy, acknowledged Andrew Boulton, MD, a professor of medicine at the University of Manchester, U.K., and a visiting professor at the University of Miami. But it may be very good for detecting clinically significant neuropathy. “We’re talking about identifying the patient with neuropathy of sufficient severity that they are at risk of developing foot ulcers,” Boulton said. It’s also important to establish what constitutes a positive test. In the 1998 paper by Armstrong et al, loss of sensation at more than four sites out of 10 was considered positive. A 2010 study from Canada concluded that having fewer than five of eight sensate stimuli discriminated four-year risk of DPN.21 Rogers, who, like Armstrong, uses the ADA guidelines, said that he considers the loss of sensation at one site out of the recommended four to be positive. Of course, such tests are only as good as the person administering them, so it’s important to pay attention to the nuances. “You don’t just ask if they feel the monofilament, because you’ll get a lot of false positives, particularly if they have their eyes open,” he said. He has patients close their eyes, then tests the same site twice, with the same pressure. He asks, “Do you feel it now? Or now?” The results of this approach, he’s found, are much more accurate. Practical considerations arise in relation to the condition of the foot, as well. As noted earlier, calluses can complicate matters. Dilnot believes that monofilament testing can be thrown off by the level of protein glycosylation in the skin, as well, since that also affects elasticity. To compensate, he tests eight sites: the tip of the first and third toes, the sides of the first and fifth metatarsals, the styloid process, the navicular tuberosity, and the medial and lateral malleoli. Rogers agreed that calluses complicate the picture. Rogers pointed out another advantage to the biothesiometer: it provides more information than a yes-or-no answer. The device has its limitations, however. It’s expensive—around $1500—and it requires a power supply. For these reasons alone it’s impractical as a quick screening method in some settings, particularly in developing nations. The Ipswich test was developed because its inventors determined that fewer than a third of diabetes patients in U.K. hospitals had received a foot exam while there, and 3% developed new ulcers during their stays. Admitting doctors said that they didn’t screen because they often couldn’t find a monofilament tester. One might wonder why they’re so hard to come by, but in any case the Ipswich test was a success: compared against a gold standard of VPT greater than 25 V with a biothesiometer, the touch test had sensitivity and specificity values similar to 10-g monofilament testing. When used at six sites (the authors’ eventual recommendation), the touch test missed just 12 of 147 patients diagnosed as at risk by monofilament testing, and gave only four false positives. 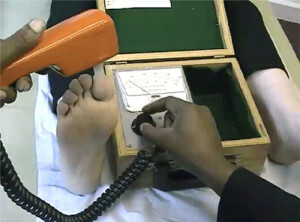 In 2000, researchers tested 248 patients from three large diabetic foot centers for risk factors using a battery of tests: neuropathy symptom score, NDS, VPT, monofilament, joint mobility, peak plantar pressures, and vascular status.23 The NDS included VPT, temperature perception, pinprick test, and Achilles reflex test. Subjects were evaluated at baseline, then every six months for a mean of 30 months. Seventy-three (29%) developed a total of 95 foot ulcers during the study. The authors concluded that clinical examination (NDS) and the monofilament test were the most sensitive for examining patient at risk for ulceration, especially when both were used together; the combination of NDS and monofilament tests identified all but one of the 95 ulcerated feet. One issue that has dogged monofilament testing is that once a patient loses sensation, repeated pricks from a nylon line aren’t going to tell the clinician anything new. Those patients may benefit more from diligent follow up on the part of the practitioner, Andrew Boulton said. Regardless of the form it takes, good clinical follow up decreases reulceration rates by 60%, and amputations by 85%.25-27 David Armstrong thinks clinicians need to change the way they think about the problem, and his terminology reflects this. 1. DiPiero A, Dorr DA, Kelson C, Bowen JL. Integrating systematic chronic care for diabetes into an academic general internal medicine resident-faculty practice. J Gen Intern Med 2008;23(11):1749-1756. 2. Boulton AJ, Vinik AI, Arezzo JC, et al. Diabetic neuropathies: a statement by the American Diabetes Association. Diabetes Care 2005;28(4):956-962. 3. Muller IS, de Grauw WJC, van Gerwen WHEM, et al. Foot ulceration and lower limb amputation in type 2 diabetic patients in Dutch primary health care. Diabetes Care 2002;25(3):570-574. 4. Rayman G, Vas PR, Baker N, et al. The Ipswich Touch Test: a simple and novel method to identify inpatients with diabetes at risk of foot ulceration. Diabetes Care 2011;34(7):1517-1518. 5. Booth J, Young MJ. Differences in the performance of commercially available 10-g monofilaments. Diabetes Care 2000;23(7):984-988. 6. Armstrong DG. The 10-g monofilament: the diagnostic divining rod for the diabetic foot? Diabetes Care 2000;23(7):887. 7. Miranda-Palma B, Sosenko JM, Bowker JH, et al. A comparison of the monofilament with other testing modalities for foot ulcer susceptibility. Diabetes Res Clin Pract 2005;70(1):8-12. 8. Nather A, Neo SH, Chionh SB, et al. Assessment of sensory neuropathy in diabetic patients without diabetic foot problems. J Diabetes Complications 2008;22(2):126-131. 9. Boulton AJ, Armstrong DG, Albert SF, et al. Comprehensive foot examination and risk assessment: A report of the task force of the foot care interest group of the American Diabetes Association, with endorsement by the American Association of Clinical Endocrinologists. Diabetes Care 2008;31(8):1679-1685. 10. Armstrong DG, Lavery LA, Vela SA, et al. Choosing a practical screening instrument to identify patients at risk for diabetic foot ulceration. Arch Intern Med 1998;158(3):289-292. 11. Smieja M, Hunt DL, Edelman D, et al. Clinical examination for the detection of protective sensation in the feet of diabetic patients. International Cooperative Group for Clinical Examination Research. J Gen Intern Med 1999;14(7):418-424. 12. Feng Y, Schlosser F, Sumpio B. The Semmes Weinstein monofilament examination as a screening tool for diabetic peripheral neuropathy. J Vasc Surg 2009;50(3):675-682. 13. Lee S, Kim H, Choi S, et al. Clinical usefulness of the two-site Semmes-Weinstein monofilament test for detecting diabetic neuropathy. J Korean Med Sci 2003;18(1):103-107. 14. McGill M, Molyneaux L, Spencer R, et al. Possible sources of discr4epancies in the use of the Semmes Weinstein monofilament (impact on the prevalence of insensate foot and workload requirements). Diabetes Care 1999;22(4):598-602. 15. Saltzman CL, Rashid R, Hayes A, et al. 4.5-gram monofilament sensation beneath both first metatarsal heads indicates protective foot sensation in diabetic patients. J Bone Joint Surg Am 2004;86(4):717-723. 16. Kamei N, Yamane K, Nakanishi S, et al. Effectiveness of Semmes-Weinstein monofilament examination for diabetic peripheral neuropathy screening. J Diabetes Complications 2005;19(1):47-53. 17. Thomson MP, Potter J, Finch PM, Paisey RB. Threshold for detection of diabetic peripheral sensory neuropathy using a range of research grade monofilaments in persons with type II diabetes mellitus. J Foot Ankle Res 2008;1(1):9. 18. Mayfield JA, Sugarman JR. The use of the Semmes-Weinstein monofilament and other threshold tests for preventing foot ulceration and amputation in persons with diabetes. J Fam Pract 2000;49(11):S17-S29. 19. Young D, Schuerman S, Flynn K, et al. Reliability and responsiveness of an 18 site, 10-g monofilament examination for assessment of protective foot sensation. J Geriatr Phys Ther 2011;34(2):95-98. 20. Feng Y, Schlosser FJ, Sumpio BE. The Semmes-Weinstein monofilament examination is a significant predictor of the risk of foot ulceration and amputation in patients with diabetes mellitus. J Vasc Surg 2011;53(1):220-226. 21. Perkins BA, Orszag A, Ngo M, et al. Prediction of incidents of diabetic neuropathy using the monofilament health examination: a four-year prospective study. Diabetes Care 2010;33(7):1549-1554. 22. ADA. Standards of Medical Care in Diabetes–2011. Diabetes Care 2011;34(S1):S36. 23. Pham H, Armstrong DG, Harvey C, et al. Screening techniques to identify people at high risk for diabetic foot ulceration. Diabetes Care 2000;23(5):606-611. 24. Arad Y, Fonseca V, Peters A, Vinik A. Beyond the monofilament for the insensate diabetic foot: a systematic review of randomized trials to prevent the occurrence of plantar foot ulcers in patients with diabetes. Diabetes Care 2011;34(4):1041-1046. 25. Edmonds M. Experience in a multidisciplinary diabetic foot clinic. In: Connor H, Boulton A, Ward J, eds. The Foot in Diabetes. New York: Wiley; 1987:121-131. 26. Edmonds ME, Blundell MP, Morris ME, et al. Improved survival of the diabetic foot: the role of a specialized foot clinic. Q J Med 1986;60(232):763-771. 27. Apelqvist J, Ragnarson-Tennvall G, Persson U, Larsson J. Diabetic foot ulcers in a multidisciplinary setting: an economic analysis of primary healing and healing with amputation. J Intern Med 1994;235(5):463-471.